[174 Pages Report] The global proactive security market size was USD 16.01 billion in 2017 is projected to reach USD 41.77 billion by 2023, growing at a Compound Annual Growth Rate (CAGR) of 15.1% during the forecast period. The base year for the study is 2017 and the forecast period is 2018–2023. The objective of the study is to define, describe, and forecast the proactive security market by solutions, services, organization size, verticals, and regions. It also analyzes recent developments, such as partnerships, strategic alliances, mergers and acquisitions, business expansions, new product developments, and research and development (R&D) in the global market. 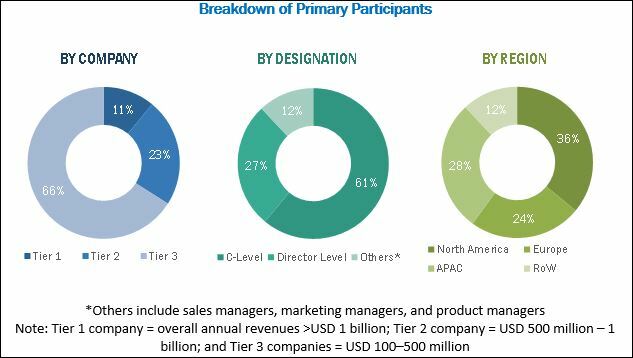 The proactive security market comprises key vendors, such as IBM (US), Symantec (US), McAfee (US), FireEye (US), Cisco (US), Palo Alto Networks (US), FireMon (US), LogRhythm (US), CyberSponse (US), RSA Security (US), Rapid7 (US), Demisto (US), ThreatConnect (US), Phantom (US), Securonix (US), Corvil (Ireland), Qualys (US), Siemplify (US), Skybox Security (US), Centrify (US), Oracle (US), Swimlane (US), AlienVault (US), Trustwave (US), and Aricent (US). These vendors provide proactive security solutions and services to end-users for catering to their unique business requirements, productivity, compliances, and security needs. 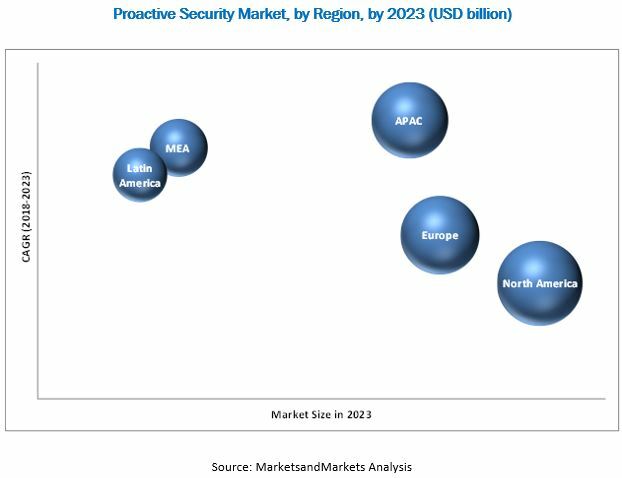 MarketsandMarkets forecasts the global proactive security market size to grow from USD 20.66 billion in 2018 to USD 41.77 billion by 2023, at a Compound Annual Growth Rate (CAGR) of 15.1% during the forecast period. Increasing sophistication of cyberattacks, along with the rising need to meet compliance requirements, are expected to drive the adoption of proactive security solutions for the protection of their sensitive information. Moreover, the SMEs segment is gaining a high traction in the market, as SMEs are more vulnerable to internal and external data breaches. With the adoption of proactive security solutions, organizations can effectively maintain and secure their critical information from data breaches. Proactive security solutions help organizations optimize their security infrastructure, easily manage security vulnerabilities, and control all their security products from a single platform. Proactive security solutions include various solutions for prevention, such as security analytics, AMP, security monitoring, attack simulation, security orchestration, and risk and vulnerability management. The risk and vulnerability management solution is expected to dominate the proactive security market and is estimated to have the largest market size in 2018. The security analytics solution would play a key role in changing the market landscape and is expected to grow at the highest CAGR during the forecast period, as global organizations are highly proactive in improving their IT security and protecting sensitive information from data breaches and malware attacks. The BFSI is the fastest-growing vertical in the proactive security market, as BFSI companies have stringent legal and regulatory compliances associated with information security. Small and Medium-sized Enterprises (SMEs) continue to deploy proactive security solutions, as SMEs are increasingly facing malware-based and DNS-based cyber-attacks. North America is estimated to hold the largest market size in 2018. The increasing need for organizations to protect their data from advanced cyber-attacks and addressing the stringent government regulations are expected to drive the proactive security market. Furthermore, rapid economic growth in the major countries, along with regulatory reforms and economic stability, is expected to drive the market in Asia Pacific (APAC). In Middle East and Africa (MEA), enterprises belonging to a range of verticals, such as BFSI, government, education, and manufacturing, are expected to increase their investments in proactive security solutions and services. Security vendors are offering proactive security solutions via security analytics, AMP, security monitoring, attack simulation, security orchestration, and risk and vulnerability management. As the frequency of security breaches has increased over the past 5 years, organizations have increased their IT security investments to protect against advanced threats. However, for many enterprises, including SMEs, these investment costs are a matter of concern. Furthermore, for a strong and advanced security, the cost of innovation is still high, and thus many organizations view budgetary constraints as a barrier to the adoption of proactive security solutions and services. The increasing adoption of cloud-based solutions and services among enterprises would provide significant growth opportunities to proactive security solution vendors. There are several established players, such as IBM (US), Symantec (US), McAfee (US), FireEye (US), Cisco (US), Palo Alto Networks (US), FireMon (US), LogRhythm (US), CyberSponse (US), RSA Security (US), Rapid7 (US), Demisto (US), ThreatConnect (US), Phantom (US), Securonix (US), Corvil (Ireland), Qualys (US), Siemplify (US), Skybox Security (US), Centrify (US), Oracle (US), Swimlane (US), AlienVault (US), Trustwave (US), and Aricent (US).